What Is a Grand Hotel or Grande Dame Hotel? "Grand hotel" and "grande dame hotel" sound romantic and capture travelers' attention and imagination. But what do these terms refer to exactly? A grand or grand dame hotel is the most famous hotel in its city, a place locals are proud to point out to visitors. In a major metropolis, there may be several grand hotels, all rivals. And in many European cities, the grand hotel is called that: Grand Hotel Bordeaux, Grand Hotel Stockholm, and so on. A grand hotel is a landmark as architecturally notable as the city hall or opera house, and very often is protected by designated historical status. Grand hotels play a role in their city's lore, and locals all know it. Some examples: Hotel ICON (shown), Hong Kong's most famous boutique hotel; The Alvear Palace in Buenos Aires, Evita Peron's elegant haunt in the Recoleta district (not far from her eventual tomb); The Peninsula Hong Kong, built during the British Empire's colonial heyday; The U.S. Grant, San Diego's downtown icon, where local society has celebrated family milestones since 1910; and The Plaza Hotel New York, whose Champagne bar entertained "robber barons" of the 1890s and draws today's bubbliest Manhattan crowd. A grand or grande dame hotel need not be an urban property. It can be a super-luxe, patrician resort in a time-honored vacation area, whether beachfront or bucolic. You can bet that a grand hotel in a rural setting will be vast and magnificently landscaped, with pools, woods, ponds, gardens, horseback riding trails, tennis courts, and a golf course. Plus a ghost story (the most extreme of which is The Shining). A happier example: The Sagamore, an elegant family resort majestically set on Lake George in upstate New York's Adirondacks. Location, location, location! A grand or grand dame hotel has a prime location in an impressive setting: the crest of a beach, or a hilltop, or overlooking Central Park, like the best hotels in Manhattan. The prime setting of a grand or grand dame hotel guarantees its guests unforgettable views. Some grand hotels with look-at-me settings: The Langham, Chicago is within a Windy City architectural icon, a Mies van der Rohe skyscraper; The Pierre New York at Central Park's most fashionable corner; The Peninsula Hong Kong, on a promontory lording it over the harbor and skyline; Disney's Grand Floridian Resort & Spa overlooking Disney World in Orlando; Palace Hotel Tokyo, standing tall and overlooking the Japanese royal family's Imperial Gardens ; Regent Taipei, imposing set on a rise beside Taipei 101, Taiwan's answer to the Empire State Building. The grand entrance to a very grand hotel. 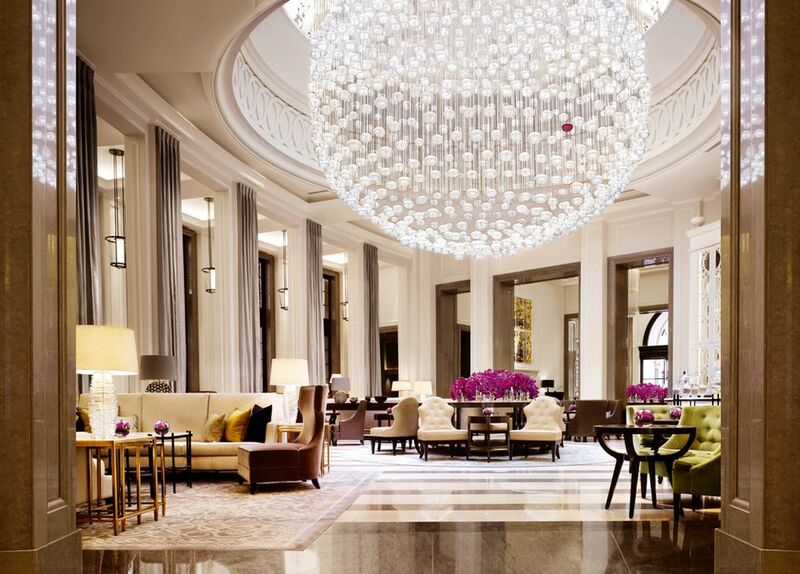 © The Langham, London. A grand or grande dame hotel has a backstory worthy of a book, and is stuffed with possesses history, legend, and lore. Sometimes, a grand hotel's charisma is heady enough for a whole book, such as Hotel by Arthur Hailey. The subject of this 1965 best-seller was a thinly fictionalized New Orleans hotel that is today the grande dame Waldorf Astoria New Orleans. Some grand hotels have fabulous tales to tell: Hôtel de la Cité sits inside the iconic rampart walls of medieval Carcassonne, France, the last stand of the doomed Cathar reformers; The Langham, London, was the birthplace of English High Tea in the 1860s, and is still the home of London's best tea service; Esplanade Hotel in Zagreb, Croatia's capital, a 1920s jewel beside the Orient-Express train station, with atmosphere straight out of an Agatha Christie mystery. A grand or grand dame hotel's service is elegant yet discreet. It is amply staffed with employees scurrying about. In a well-managed property with true luxury hotel service, personnel devote themselves to serving guests, not to strutting about self-importantly in their snappy uniform. Following the rules of true luxury hotel service, staffers devote themselves to serving guests, not to strutting about self-importantly in their snappy uniforms. At The Pierre Hotel New York, an elevator ride with a charming staffer is a moment of grace; at any St. Regis hotel, discreet butlers do your unpacking and packing, giving you more time to play and explore. A true grand or grand dame hotel has a lobby that's a hub of social life. It's a high-energy space with plenty of seating, waving, air-kissing, and an air of excitement. (These days, free wifi, too.) A grand hotel's lobby is a place where a guest will want to camp out, pretending to work on an iPad, but actually just drinking in the social whirl (and possibly a house cocktail). Where it's hot, so is a grand hotel's pool scene. At grand hotels in sunny climes, the pool area functions as a beehive of networking. May I present to the luxury travel jury: Taj Mahal Palace & Tower in Mumbai, India, whose lobby and pool are as glamorous as a Bollywood production. What's a grand or grand dame hotel without a standout anecdote...or (even better) a juicy scandal? Every grand hotel tells a story. Or several. And amorous (or mysterious) twists never lose their appeal. At Montreal's Queen Elizabeth Hotel, there's a waitlist for nights in the suite where John Lennon and Yoko Ono staged their "Bed-In" in 1969. Across the Atlantic, in Sweden, Nobis Hotel is set within the bank building where victims' reaction to a 1973 bank robbery birthed the phrase Stockholm syndrome. A grand or grand dame hotel is not only a lure for luxury travel visits. It is a citadel of destination dining, and houses one (or more) of its locale's very best restaurants. Often, the eatery is as famous as the hotel itself, and everyone wants to eat there. In Toronto, Susur Lee's Luckee restaurant has made the SoHo Met hotel an Entertainment District go-to. At the Dan Tel Aviv, the impressively global breakfast buffet is where some of the town's top execs hold their first meeting of the day. At Fairmont Grand Del Mar in Southern California, Addison Restaurant has accrued rare honors from Relais & Chateaux and from hard-to-please LA Times critics. A grand or grande dame hotel stays fresh in the news and in the public eye. The property may be old in years, but it stays top-of-mind thanks to public-relations savvy. Some ever-young grand hotels: The Dolder Grand in Zurich, Switzerland, prominently featured in The Girl with the Dragon Tattoo; Fairmont Miramar Hotel & Bungalows in Santa Monica, California, whose palm-shaded pool has been the backdrop for Hollywood deal-making since it opened in 1921; Hotel Kämp in Helsinki, Finland, built in 1887, now gets attention for its Champagne bar, sushi bar, and "Best Day Spa in Europe" award. A grand or grand dame hotel keeps up with appearances: its own. Its management does not skimp on décor. The hotel is refurbished frequently and renovated regularly. And a grand hotel's common spaces and guest rooms are filled with art of the genuine and pricey sort. Some grand hotels have art everywhere. Le Negresco in Nice, France (shown) flaunts a museum-level collection of art from Napoleon portraits to Picasso nudes. Four Seasons Baltimore Hotel displays notable paintings, including several by Frank Stella. The Ritz-Carlton, Seoul has more than Gangnam style; it has precious collections of Asian paintings and ceramics. A grand or grande dame hotel is catnip to upscale engaged couples seeking a refined wedding that their guests will see as a luxury getaway. The tasteful twosomes count on impeccable nuptials – and impressive name-dropping for years to come. At the elegant La Fonda on the Plaza in Santa Fe, New Mexico, the exquisite vintage ballrooms are booked years in advance by twosomes wanting to get hitched grandly. But Will You Like Staying in a Grand or Grande Dame Hotel? Now, whether or not you like the grand hotel experience is a matter of personal taste. My feeling is this: on a luxury traveler's first visit to a city, it's a good idea to stay in the most important, most famous hotel in town -- the grand or grande dame hotel. Stay and decide: are grand hotels for you? Perhaps you will find yourself captivated by a famous hotel's mythology and aura, and find yourself retelling the hotel's legends (like the daily parade of The Peabody Ducks at The Peabody Memphis, shown). On the other hand, you may find that a grand or grande dame hotel is pompous, or impersonal, or old-fashioned. But you will have "lived the legend" and seen for yourself why grand hotels endure and thrive.